Outreach lines from DCarsonCPA to help your New York City Business on Growth, from the practice that's all about using the knowledge of the Economy to help on the Economy. From DCarsonCPA the Empire Lines and DCarsonCPA PRTC Lines an Exciting new venture to help Business, Entrepreneurs, Small Business, Medium Business and Large Entities get the word out on Services, Products and Events. Also available for Non Profits and Government support lines on Outreach to help Communities. DCarsonCPA Empire (blog) Lines periodic updates and Entity and SME lines on Linked in to help on Growth Cycle needs on Awareness for Business and Services Outreach to map Supply to Demand in the Economy and Financials. 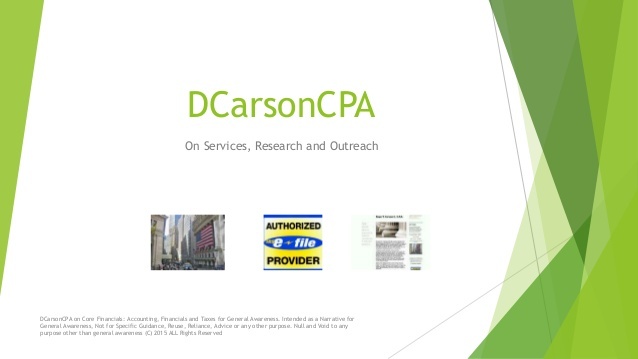 DCarsonCPA is the Brand of the Practice of Dean T. Carson II, CPA focused for 6+ years on helping the lines of growth and economic recovery in NYC and Nationwide on the Outreach lines. We are Globally minded to help on Local, Regional, State, Multi-State, National and International lines where the lines of Free Trade and persons interested in Productive Trade, Growth and teamwork on the big lines of Societal Challenges like Extreme Poverty Alleviation, Health, Potable Water, Hunger Alleviate, Responsible Stewardship of Environmental Resources. The ways that we find together to work on productive trade and growth influence the outcomes for Global Humanity. Let Free Enterprise in Balance to a Reasonable line of Cost-Benefit Weighted Regulations be Our lines to work together and help on the Opportunity lines for Growth where Industry, Non Profits, Government and Individuals / Families and Communities meet on Teamwork.